As an introduction to JamPlay, Tosin Abasi provides an interview outlining his playing style, influences and musical background. Very informative and inspiring! Love his band too! 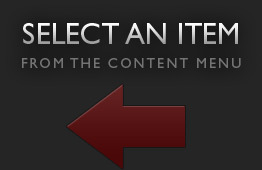 hwy the hell is there no supplement content? where are the tabs?? Does anybody know what kind of strings he's using? I want to see if I can get my 8th string to sound a little tighter. You're my guitar idol man :) respect. Tosin! man you are the re-evolution of music, man! I love your idea of no borders by genre. That's what makes your music so mindblowing. Considering I don't smoke pot or do any other drugs, your music is how I get high! After seeing this I took a look at Animals as Leaders it quickly became one of my favorite albums of all time. Looking forward to future albums! Welcome Tosin! Gosh, I have questions already... when is your first Live Q&A? There aren't any scheduled yet Sylvia. Tosin will be on tour with Animals As Leaders very soon for a number of months. Drat! by then I'll get gone. :( Oh well, at least I can watch the lessons for a while as they come up. Welcome Tosin! Can't wait for more lessons! I didn't get much of a metal vibe from the guy's appearance and what he was playing. Then I downloaded his album and...OH MY GOSH...he can play and then some! Can't wait to see what he has to offer. His album is SOOOO freakin good! Welcome Tosin, Great to have you as an instructor. Can't wait to see your lessons. holy crap. I stumbled across this guy a few months ago online but forgot his name, and now he's here. This is awesome. Tosin!! yes finally! ill be seeing animals as leaders and veil of maya in tenneesse! Welcome! Your musical background is very interesting, I can't wait for the next lesson. Hope you stick around Jamplay, take care! 1st!! welcome to the site great intro and interesting style. but u have long fingers!! haha i m lucky to reach number 6 sometimes! ... And has to be the Victor Wooten of guitar! This guy is insane... Welcome Tosin! so excited to see what you will be bringing to JamPlay. Tosin discusses harmonic and music theory ideas as they relate to the Animals As Leaders song "On Impulse." Tosin Abasi explains how bass style thumping and slap techniques can be performed on an 8 string guitar. Tosin Abasi discusses how bass techniques can be emulated on guitars with extended ranges as well as standard 6 string guitars. Tosin Abasi takes a look at a two handed tapping technique that emulates a piano-like feel. In his 14th lesson, Tosin discusses riffing in compound meter over a straight back-beat. 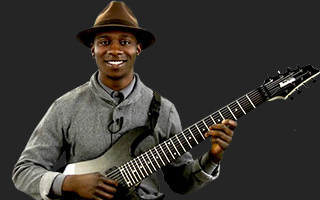 In this lesson, Tosin demonstrates a few of his favorite licks that utilize the full range of the eight string guitar as well as the economy picking technique. Tosin Abasi discusses how fingerstyle can be adapted for use on an electric guitar. Additionally, he takes a look at some advanced one string tremolo techniques that can mimic non-percussive bass thumping. In lesson 18, Tosin discusses how to organize scale patterns on the neck of the guitar using the CAGED system. In this lesson, Tosin demonstrates several alternate picking exercises aimed at improving dexterity, speed, and accuracy. About Tosin Abasi View Full Biography Hi. My name is Tosin Abasi. I'm the lead guitarist for Animals as Leaders. I've been playing the guitar for 15 years, and touring professionally on and off for about 6.